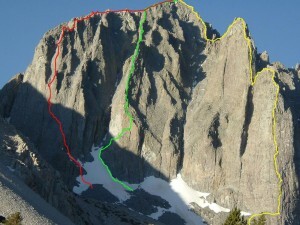 Dark Star takes the biggest line up Temple Crag and is one of the longest routes in the High Sierra. The first pitch is the crux and is followed by seven pitches of sustained 5.8-5.10 climbing. After that the route does a lot of meandering on easy 5th class. If you simul-climb, this section goes pretty fast. If you belay every inch of it, prepare for a long day! While the rock quality is not stellar, it is relatively solid compared to how dark and chossy it looks from a distance. The first 8 pitches might compare to Yosemite's Lower Cathedral East Buttress. Which SuperTopo guidebooks include a topo for Dark Star? The route as seen from Second Lake.